When you hook up wires to the terminals of a battery, charge can flow and a complete path called a circuit is formed. This flow of charge is called a current. The symbol for current is the letter I and the unit of measurement is called the ampere. The higher the current running through the wire, the more charge is flowing. How does charge flow through a circuit? When a copper wire is attached to terminals of a battery charges flow. If you put a rubber band across the terminals no charge will move. Why is this? The reason has to do with the properties of copper which is a good conductor of charge. Material that are good conductors have loosely held electrons. Movement of electrons occur very rapidly passing from atom to atom along the wire. To move the charge there must be a potential difference between two points. There is a relationship between electric potential and electric current. 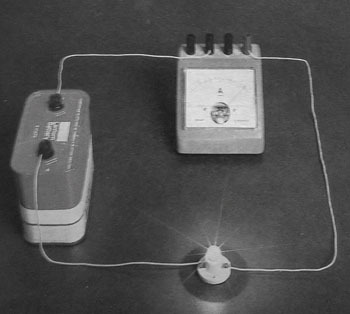 This relationship was first demonstrated experimentally by a scientist named George Simon Ohm. What is the difference between electric current and electron flow? Why are they in different directions? There is still a lot of confusion on this issue. It comes from when Benjamin Franklin first discovered electricity he thought it was positive charges that was moving along the wire. So the Current was defined as the flow of positive charge that was moving in the metal wires he was playing with (this is often referred to as Convention Current). We now know Franklin was wrong -- it was the negative (electrons) charges moving, in the direction opposite to the direction of his positive charge in the wire. It is important to point out that positive charges do not move in a copper wire but in other cases e.g., in solutions both negative and positive charges move. Where I is the current in amperes, V is the potential difference in volts, and R is a constant, measured in ohms, called the resistance. Electrons moving through a wire can move continuously through the wire in the same direction.This is called Direct Current. Electricity from dry cells or batteries is an example of direct current. Electrons may also change or alternate their direction regularly. This is called Alternating Current. The electricity in your home is alternating current. In the United States the current changes direction 120 times per second. What is the difference between the Advantages and Disadvantages of Direct Current and Alternating Current? Direct current is produced by by such sources as batteries, thermocouples, solar cells and commutator-type electric machines. Direct current not only can flow through wire but an also flow semiconductors. Direct current can be obtained from alternating current by use of a rectifier. The first commercial electric power transmission developed by Thomas Edison used direct current. DC is commonly found in many low-voltage applications especially where they are powered by batteries, Most automotive applications used DC current although the alternator is an AC device which is used to produce DC current. Most electronic devices require a DC current. AC current is the way electricity is supplied to homes and businesses. 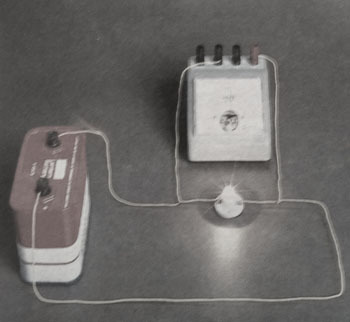 The first recorded application of AC current was by Guillaume Duchenne who invented electrotherapy. He concluded that AC was superior to DC for elecrotherpuetic triggering of muscle contractions. A power transformer was first demonstrated in London in 1881 by Lucien gaular and attracted interest by Westinghouse. Although they applied for patents on their technologies, they were overturned because Nikola Tesla was able to show prior work in the field. Nikola Tesla is most well known for developing the modern alternating current electrical supply system. AC voltage may be increased or decreased with use of a transformer. Use of high voltage leads to significantly greater efficiency in transmission of power.The disadvantage of high voltage is that a greater amount of insulation is required. How do we measure an electric current? To measure voltage or Electric Potential you put the volt meter in parallel in the circuit. A voltmeter must be connected in parallel to measure the voltage of a device because objects in parallel experience the same potential difference. See image below. The relation between electric current, magnetic fields and physical forces was first recognized by Hans Chrisian Orsted in 1820. He observed a compass needle was deflected from pointing North when a current flowed in an adjacent wire. This was know as a tangent galvanometer. The tangent galvanometer was used to measure currents using this effect. The restoring force to zero the meter in this system was the force of the earths magnetic field. So, the meter could only be used when aligned to the Earth's magnetic field. Sensitivity of the instrument was possible by increasing the turns of wire used. a) he thought it was electrons that moved along the wire. b) he thought it was positive charges that was moving along the wire. d) In DC the electrons moving through a wire can move continuously through the wire in the same direction, in AC the electrons periodically change direction. 5. What does an Ammeter do?